[miau] It seems like everyone got caught up in the soccer World Cup competition, which includes the developers of the Golden Goal slot machine. This is a pretty simple machine that does its best to mix the excitement of soccer with the anticipation of an online slot machine. There really is no plot with the Golden Goals Slot machine, even though a story line could help to make the game more interesting. You do not accumulate goals or wins on your way to a World Cup and you are not able to defend your country’s honor on the field. This is a very compact little slot machine that uses soccer symbols that most sports fans around the world will be familiar with. The sounds on Golden Goals are actually a lot of fun. Each time you spin the reels, you get the sound of a foot making contact with a soccer ball. The crowd cheers as your reels spin and the crowd really goes crazy when you hit a bonus or major payout. The graphics are clear and easy to understand. One of the things that you will like about Golden Goals is that there really are no surprises. 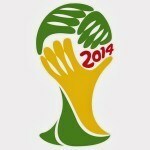 You expect to see soccer images and that is exactly what you get. The wild image that appears all over the board is a soccer ball and the other icons are things like soccer shoes and a soccer goal. This is an old-fashioned slot machine with three reels and one pay line. But it has a lot of different ways you can win. For example, some of the icons on the reels have numbers on them that can lead to bonus points if all three reels add up to anywhere between six and 10. A total of 11 triggers the big bonus and you can win a multiplier that could be worth as much as 10,000 times more. If you line up three soccer balls in a row, you get to play the bonus round and that is actually fun. The end result can be the grand prize, which varies depending on how much you have built up in the pot throughout the game. There are also scatter bonuses that can pay a lot if you hit them just right. 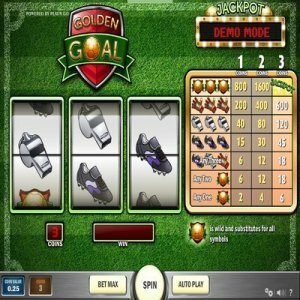 Golden Goals is a straightforward slot machine that offers a little more than your standard three-reel, one pay line machine. The crowd noise actually starts to escalate if you hit successive bonus spins and that can make the game much more exciting. This is a fun slot machine to play and the best part is that you don’t even need to like soccer to enjoy playing this game.